There's plenty of things to be proud of if you're a resident of Memphis, TN. It has one of the best music scenes in America and is home to some pretty delicious food. The city is also the place where the legendary Elvis Presley was born and raised, and his mansion, Graceland, remains as one of its most visited tourist attractions. You will never run short of excitement living in Memphis, but you can run short of time if your yard needs to be maintained regularly. Lawn Love can handle that for you with our ever trusty yard care service. No one does yard care like us and we have some of the top independent lawn technicians in the business to show you why we're one of the very best. The yard care industry is one of the oldest out there, but Lawn Love is looking to give it a modern day touch by allowing customers to set up our services through our website and mobile app. Everything can be done within minutes and we have some of the most competitive rates in the market. We can do a whole bunch of yard-related chores including lawn mowing, planting, weed removal, and leaf clean up. Allow us to turn your yard around by calling us at 901-410-4492 or by asking for a free two-minute quote. We'd love to hear from you soon. 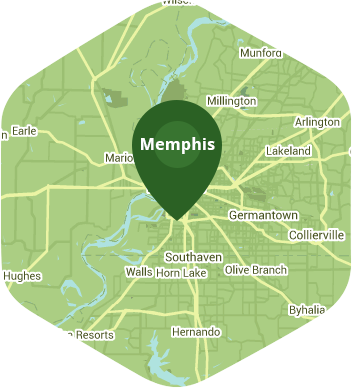 Here are some average prices for homes in Memphis. Average size of area treated 5,783 sq. ft.